I am trying to get rid of some the structures that come with the mod because they never spawned in right except I can't seem to find any reference pictures with names on which any of the ruins structures are. Most of them I have been able to guess, but there are some I can't figure out. If someone can help me out, I would greatly appreciate it. Voila! An alchemist's dungeon popped out. Note you need to include the folder name (in this case, "generic/") and leave off the ".tml" suffix. There's an error in template file config/ruins_config/generic/PirateShip.tml . The value of its parameter leveling_buffer should be -1 (negative one), not 0 (zero). Fix that--making sure not to add spaces to the line in the process--and your problem will go away. Caveat: As noted somewhere below, if you edit a template file while the server is running, you'll have to restart for the change to take effect. 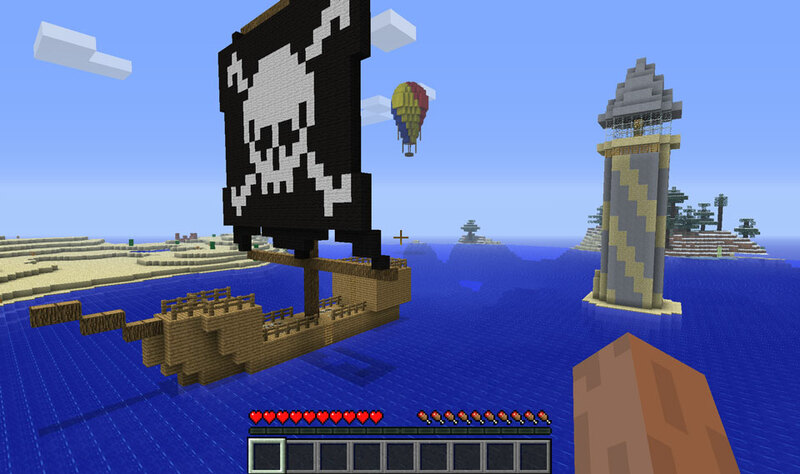 Also, any already-spawned pirate ships in your world will continue to exhibit the problem you noted; there's no way to retroactively fix structures after they spawn (aside from flying around in creative mode and repairing them manually). All new ones spawned after the correction to the template is made, though, should be good. Thank you so much for updating this mod, always a favorite of mine to include in all my personal packs along also with Recurrent complex. Y u no have change logs? Old templates do not work, is there any way to make them work again? How do I remove "BlockName [Block], blockID [block], metadata " in my chat everytime I use a stick? It's annoying. Currently, there's no way to disable that feature. I'd say being able to do so is a good idea, though--maybe post it as a suggested enhancement on the GitHub Issues page? Can't get this mod in the twitch client. Currently using an MC profile with version 1.12.2, Twitch client version is 7.5.6563.2244. I would be super appreciative if I can get some answers to a few questions about using this mod. Are there any config options other than the ruins.txt file? Can I just delete a .tml file of a structure I don't want to spawn? Am I correct in understanding that if I go to a creative world, make a structure and save it the way you show here: https://www.youtube.com/watch?v=E9cNolY_LsQ -- Then when I generate a new world that structure will have a chance to spawn? Also would that generate a .tml file in ruins_config, and I could move that into the biome I want it to spawn in? Thank you so much in advance if anyone can answer these :) Really great mod! I assume you mean the default ruins.txt file that's created if you don't already have one, as when you run the mod for the first time. The short answer is...no. Two things to note, though. 1) If, after this default ruins.txt is created, you install any mods that add new biomes, corresponding config entries for "specific_<biome>" won't automatically be added to the file. As a result, these will default to 0, meaning only generic templates will be instantiated in the new biomes. You'll have to add these entries manually, or--better still--delete ruins.txt and restart the server to create a new one. An entry will be generated for every registered biome at the time the file is created. 2) Two obsolete options currently appear in the default file: "chance_for_site_normal" and "chance_for_site_nether". These have no effect and can be deleted. Yes. If the server is running at the time you delete the file, however, the template remains in memory and is still eligible for natural spawning until the next restart. This will not remove instances of the deleted template already in the world, if any. Am I correct in understanding that if I go to a creative world, make a structure and save it the way you show here ... Then when I generate a new world that structure will have a chance to spawn? Not naturally, no. You can use the /testruin command to instantiate the new template manually, of course, but it's not eligible for natural spawning until the template file is copied from the templateparser folder to one of the biome folders (or the generic folder) and the server is restarted. The new template file lands in ruins_config/templateparser (in 1.12.2, anyway). As above, yes, you'd copy or move it to one of the biome folders and restart the server. Natural generation only occurs when chunks are loaded for the first time; your new template won't be instantiated retroactively in already-explored areas. Every template has two parameters relevant to this question: "acceptable_target_blocks" and "unacceptable_target_blocks". The defaults are all blocks (= structure can spawn on top of any material) and no blocks (= structure is not prevented from spawning on top of any material), respectively. If you want to prevent a structure from spawning on ice, either remove "ice" from the list of acceptable target blocks, if it has one, or add "ice" to the list of unacceptable blocks (or start a new list, if there isn't one). The latter is probably easier, since unacceptability takes precedence, so will work even if "ice" happens to be on both lists. Your specific example looks like an instantiation of generic/Altar.tml. That template doesn't specify acceptable_target_blocks list, but it does unacceptable_target_blocks. Just append ",ice" onto the end of that list, and you're good to go. Well...after the server is restarted, that is. And you've similarly modified all other templates you want to keep off frozen lakes. You're also stuck with any structures that may have already spawned in the world before you made these changes. Thank you so much for the very detailed reply! I really appreciate it! Ruins 1.12.1 doesn't load in Forge 1.12.2.
will the 1.12 work with 1.12.2 ? ?